Surrender causes huge damage to Naxalites of the Communist Party of India (Maoist) or CPI-M. Possibly, the impact is greater when a person ranking high in the hierarchy of the rebels surrenders. On February 11, 2019, a Central Committee member (CCM), Oggu Satwaji alias Sudhakar alias Buriyar alias Kiran alias Sarath, a native of Sarangapur, Nirmal District (a part of the now bifurcated Adilabad District), Telangana State, surrendered to the authorities, along with his wife. At the time of his surrender he was a key member of the Eastern Regional Bureau (ERB) and was active in the Bihar-Jharkhand Special Area Committee (BJSAC). Sudhakar’s surrender preceded the apprehension of his brother and the latter’s associate in Ranchi, in September 2017. At the time, in the continuing effort to crack down on Maoist finances, the police had seized a total of Rs 25 lakh in cash and half a kilogram of gold worth Rs 12 lakh from them. Sudhakar wanted the money, which he was extorting from mineral-rich Jharkhand, to be invested in real estate. After the founding of the CPI-M on September 21, 2004, he is the third CCM to give-up the revolutionary path. Lanka Papi Reddy alias Lachchanna and Jinugu Narasimha Reddy alias Jampanna had earlier surrendered to the authorities. Incidentally, all three belong to Telangana State where the rebels had once held sway but have been near totally wiped out; they have since been making unsuccessful attempts to stage a come-back. Besides, some State Committee Members, too, have surrendered; for instance, Gudsa Usendi and Arjun of the Dandakaranya Special Zone Committee (DKSZC). The surrender of a high-ranking Maoist leader would most likely spur the surrender of a number of rebels, cutting across ranks. In Andhra Pradesh and Telangana, surrenders are encouraged in a big way. A senior IPS officer told this researcher, ‘the government lays great emphasis on surrenders also because it shatters the myth of the Naxalism’. 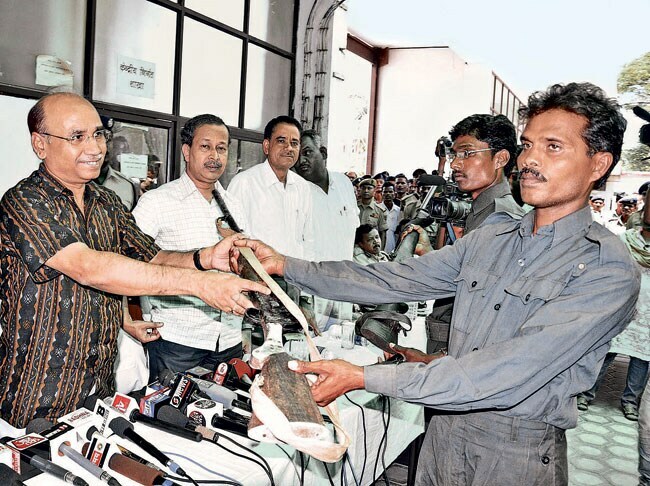 Further, as a well-known authority on the Maoist movement noted, ‘While the surrendered Naxalites stood as living examples of a life completely wasted as they could not reintegrate themselves into the society, and the suffering of the families whose members were still in the Naxal-fold provided another example for the people not to mess with the Naxalites. This led to the distancing of several segments of the society, which would have hitherto been target groups, from being attracted towards the underground’. There is no particular reason for Naxalite ranks surrendering to the authorities. Routinely, the media reports in each case state that he or she has been disillusioned with the ideology and the movement and has, therefore, surrendered. However, the reasons could be many and disillusionment may not be the real reason. Sudhakar, a squad member and a native of Karimnagar district, Andhra Pradesh, surrendered to the authorities because he was severely affected with Malaria and was not given medical treatment by the Naxal leadership. As a result he became a physical relic, could barely move his limbs and was nearly bed-ridden in the forests. He was, thus, frustrated with his existence and opted to surrender. Byrani Ramachander and his wife, too surrendered to the authorities. Ramachander was a squad commander. His wife was taken ill and, therefore, to get her admitted to a hospital, the couple sped away with Rs 50,000 to the neighbouring State of Maharashtra, thus deserting the ranks of the comrades. After she recuperated, the couple surrendered to the authorities in Jagityal town of undivided Karimnagar district, Telangana State. The cases of Bharati and Anupuram Anasuya were slightly different. Bharati was the wife of Polam Sudarshan Reddy alias Ramakrishna, alias RK, who was a district committee secretary in Warangal and Nizamabad districts. RK was killed in an encounter with the police in 2002. Some months later, his wife Bharati surrendered to the authorities. Similar, Anasuya was the wife of Anupuram Komarayya, member of the North Telengana Special Zone (NTSZ), which the Naxalites at one time showcased to the world as their ‘flagship guerrilla zone’. Anasuya, too, surrendered because her husband was killed. In another case, Pittala Sarita was a platoon section commander and had participated in various attacks on the police, including the unsuccessful attack on the Yeturunagaram police station in 2002. A very vocal young girl of 17-years age when this author interviewed her, she said she was influenced by her uncle who was already part of the underground and she was inspired by a song sung by a visiting armed squad in her village. She was ‘forced’ to quit the Naxalite ranks after she questioned the darker side of the activities of Polam Sudarshan Reddy and his counterpart in Nizamabad district. The surrender of rebels needs to be considered on a case-by-case basis. At the same time, while surrenders need to encouraged it is equally, if not more, important to robustly implement, within a set time-frame, the rehabilitation package promised to them. Tardy and delayed implementation of the rehabilitation package would, resultantly: (a) nullify the gains of the efforts in securing surrenders; (b) persuade the surrendered Naxalites to think that the Government fails to keep its promises, and that they were justified in joining the Naxalites to fight the State; and (c) demoralise the police officials who had painstakingly secured their surrender.